Natalie and I spent the entire afternoon at the Aberdeen Marina Club hanging out with Debbie and Olivia, Lily and Summer, Annie and Ethan, and little Jonathon. 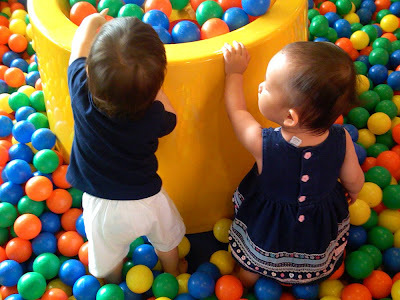 First was lunch at the Deck which was relaxing and great for chatting and catching up, followed by fun in the toddler play area (see below photos), followed by fun in the "big kids" area (fun for mums), and finally followed by a dip in the warm waters of the wading pool. Natalie was exhausted and fell asleep in the short ride home and ate a lot at dinner. Yay! 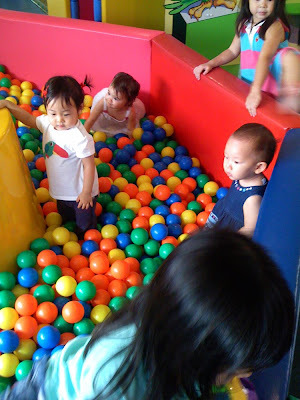 Natalie loves the ball pit. 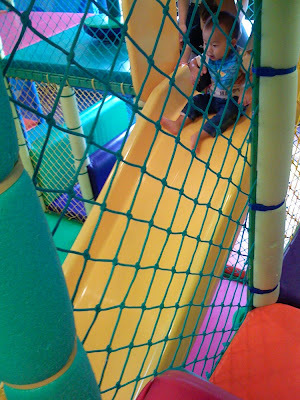 When I take her out to explore the other play areas, she'll toddle back and ask to be put back in it. Natalie likes to throw the balls. They land a whopping one feet away from her. Jonathon and Natalie try to peek over the platform. 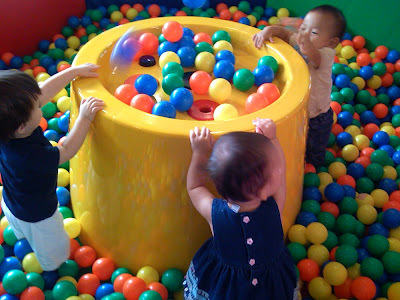 Air vents cause the balls to "float" leading to minutes of open-mouthed wonder. Ethan joins in the fun with his cute smile. Natalie blows a kiss to the camera. 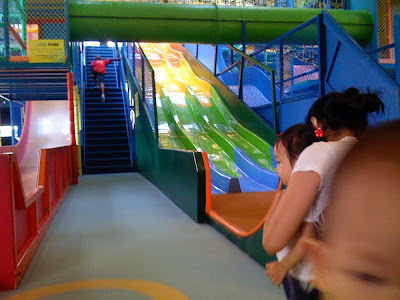 Each of the babies went down the slide a few times... on their own! We lie them flat on their back (so their head won't hit if they fall back) and send them down. Most of them LOVED it... Natalie tried it 3 times, but was undecided. View from the top of the slide. 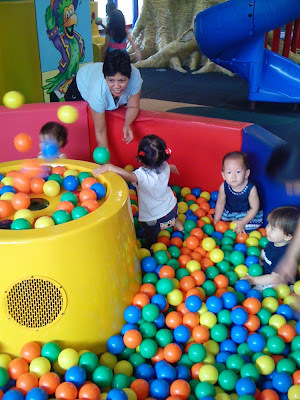 After the toddler play area, we went upstairs to the "big kids" play area. 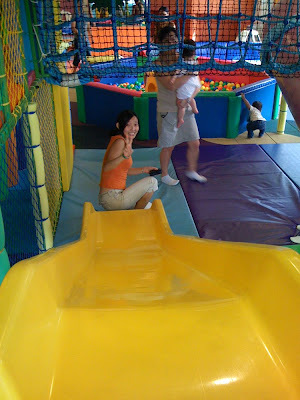 Each of the moms jumped on a mat and slid down the big slide. Fun for the whole family!